It’s a smart, easy, cost effective ($620 Free Shipping (excluding AK, HI & Canada)) way to make fire roof operations SAFER!!! The R.O.S. Platform is a new, innovative idea that makes firefighting roof operations safer than it has ever been. This tool was developed by firefighters for firefighters. 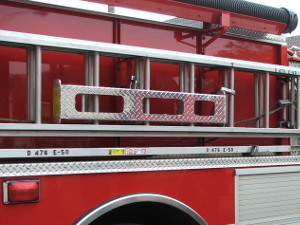 Whether you are performing vertical ventilation, dormer window rescue, chimney fire operations or any other work that requires the use of a roof ladder; this platform provides a safe and solid place for your foot when you need to leave the safety of the ladder. It gives those apprehensive crews the confidence they need to perform roof work without the fear of a slip and fall. No more placing your life and career on the head of a buried pic axe or halligan tool. No more tripping hazard caused by the handle of a rubbish hook. No more relying on the roof beneath you to support your weight. Made with light weight non-skid Aluminum diamond plate. Easily deploys to either side of the ladder. Stow-able on any NFPA standard roof ladder. Easy to stow on both Aerials and Engines. Makes for versatile, safe and secure platform for a variety of roof operations such as vertical ventilations and chimney fires. 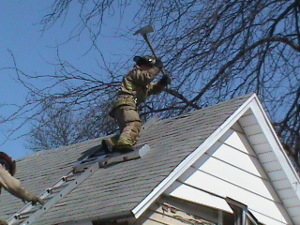 Deploys to the roof on the ladder. No additional equipment to carry. If it’s already up there, why not use it? The R.O.S. Platform has you covered! !